The Python bivittatus (or Burmese python) is one of the fifth largest snakes in the world. It is native to a large variation of tropic and subtropic areas of Southern and Southeast Asia. Until 2009 they were considered a subspecies of Python molurus. Now they are recognized as a distinct species. The Burmese python is found throughout Southern and Southeast Asia including Eastern India, Nepal, Western Bhutan, Southeast Bangladesh, Myanmar, Thailand, Laos, Cambodia, Vietnam, Northern Malaysia, far southern China, Indonesia, Southern Sulawesi, Bali and Sumbawa. It lives in grasslands, marshes, swamps, woodlands, river valleys, and jungles with open clearings. 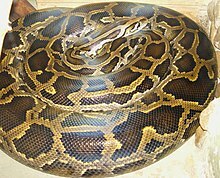 The Burmese python, like all types of snakes, are carnivorous. They mainly eat birds and mammals like mice, rats, rabbits, pigs and goats. Some have been seen eating larger animals like alligators and deer. Burmese Pythons are mainly nocturnal. Young Burmese Pythons usually live in trees and on ground but when they become older they live mainly on the ground. They are excellent swimmers and can stay underwater for around half an hour. Burmese pythons breed in the early spring and females lay around 12-36 eggs in March or April. The female python then remains with the eggs until they have hatched. Once the hatchlings use their egg tooth to cut their way out of the eggs the mother then leaves. The babies often stay inside the eggs until they have completed their first shedding of their skin, after this they leave to hunt for their first meal. Burmese pythons live for around 20 to 27 years. ↑ Jacobs, H.J. ; Auliya, M.; Böhme, W. (2009). "On the taxonomy of the Burmese Python, Python molurus bivittatus KUHL, 1820, specifically on the Sulawesi population". Sauria 31 (3): 5–11. This page was last changed on 30 March 2019, at 21:00.